Gene Signal is a Swiss-based biotechnology company pioneering the development of innovative therapies for angiogenesis-based diseases. Its product candidates are a new class of oligonucleotides, proteins and monoclonal antibodies derived from genes that are exclusively involved in the angiogenesis process. Four candidates are in development for eleven indications in ophthalmology, dermatology, vascular disorders and cancer. The company’s lead compound, Aganirsen (GS-101), an antisense DNA oligonucleotide, completed in 2013 the European I-CAN Phase III trial for the treatment of neovascular-associated corneal graft rejection. Following validation from the regulators during an EMA Scientific Advice and an FDA pre-IND Meeting, Gene Signal is currently preparing the launch of the Pivotal Phase III study of aganirsen in the prevention of Corneal Graft Rejection. 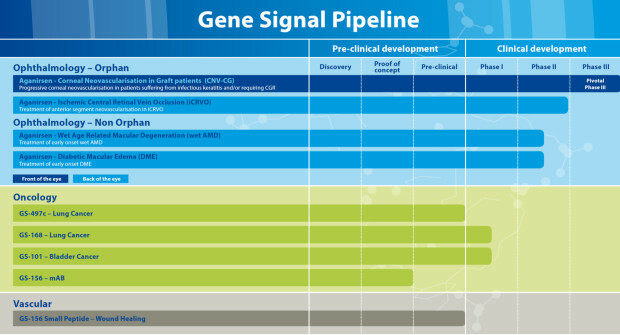 Gene Signal’s discovery program leverages a patented discovery platform, GENE-MAAP, which streamlines the identification process of genes exclusively involved in the regulation of angiogenesis, resulting in the identification and patenting of more than 94 such genes. Pre-clinical work is ongoing for Wound Healing in Vascular/Dermatology. Two product candidates in Oncology, GS-497C in Lung Cancer and GS-101 in Bladder Cancer are currently completing pre-clinical development.